How do alterations in epigenetic landscape disturb the barrier between normal and malignant states to cause cancers? How can we translate these cancer-related aberrations into more efficient cancer therapy? These are two overarching questions that our research is currently addressing. The intricate interplay between genetic and epigenetic pathways plays key roles in regulating normal and malignant cellular development. Recent technological advances have enabled us to gain comprehensive views of genetic and epigenetic modifications in normal and malignant states. By taking a multidisciplinary approach, including mouse genetics, cellular and molecular biology, biochemistry and genomics, coupled with studies of hematopoietic and non-hematopoietic cancers, we aim to understand how dysregulation of key epigenetic players leads to the onset and progression of cancers, thereby identifying novel pathways that can be clinically targeted for the prevention and/or treatment of cancers. The recent discovery of TET (Ten-eleven-translocation) enzyme functions has led to a paradigm shift in our understanding of how imbalances in DNA methylation-demethylation dynamics are coupled to cancers. The TET proteins (TET1, TET2 and TET3) alter DNA methylation status by sequentially oxidizing 5-methylcytosine. The resulting oxidized methylcytosines function as intermediates in DNA demethylation as well as independent epigenetic marks. Because DNA methylation and hydroxymethylation are highly aberrant in cancers, leading to abnormal gene expression and genomic instability, we will take the DNA methylation-demethylation cycles as a starting point of our research, with an emphasis on understanding the role of TET proteins in normal and oncogenic hematopoiesis. Global epigenomic alterations common in cancers represent an attractive target for cancer therapy because epigenetic marks are generated and erased in a highly dynamic and reversible manner. Loss of TET function is generally associated with malignant transformation. 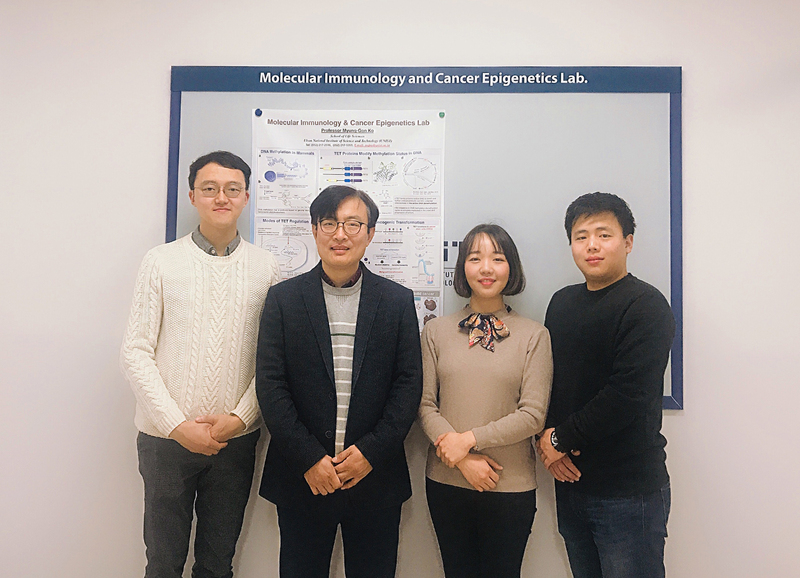 Thus, we are exploring whether manipulation of methylcytosine oxidation status by targeting TET enzymes displays clinical efficacy in cancer patients. To this aim, we will identify proteins or small molecules that physically or functionally interact with TET enzymes, then molecular basis of their action and therapeutic effects will be rigorously tested alone or in combination with conventional therapy. 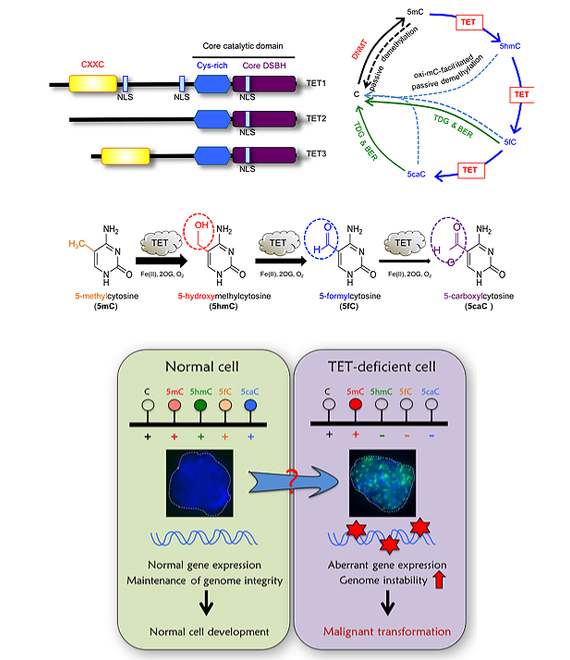 TET family dioxygenases and DNA demethylation in stem cells and cancers. DNA Demethylation of the Foxp3 Enhancer Is Maintained through Modulation of Ten-Eleven-Translocation and DNA Methyltransferases. DNMT3A and TET2 compete and cooperate to repress lineage-specific transcription factors in hematopoietic stem cells. Acute loss of TET function results in aggressive myeloid cancer in mice. DNA methylation and hydroxymethylation in hematologic differentiation and transformation. Functions of TET proteins in hematopoietic transformation. A zebrafish model of myelodysplasia produced through tet2 genomic editing. Large conserved domains of low DNA methylation maintained by 5-hydroxymethycytosine and Dnmt3a. Modulation of TET2 expression and 5-methylcytosine oxidation by the CXXC domain protein IDAX. The SWI/SNF-like BAF complex is essential for early B cell development. 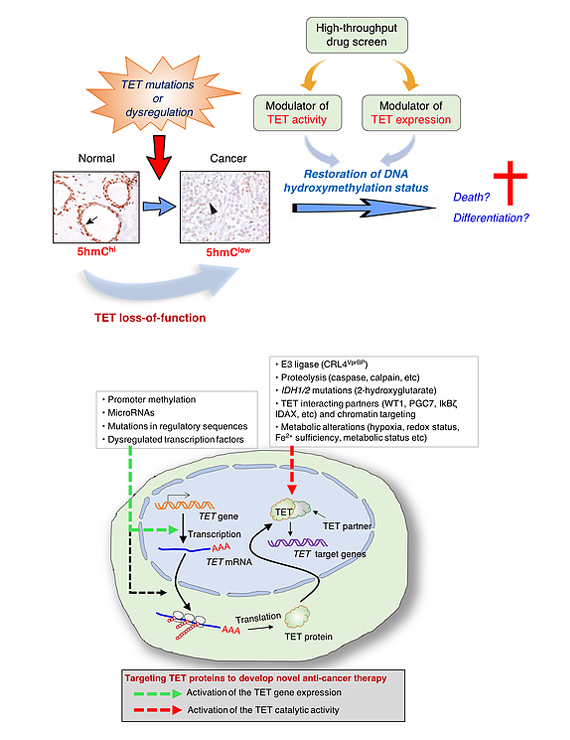 TET2: epigenetic safeguard for HSC. Ten-Eleven-Translocation 2 (TET2) negatively regulates homeostasis and differentiation of hematopoietic stem cells in mice. Genome-wide mapping of 5-hydroxymethylcytosine in embryonic stem cells. Srg3, a mouse homolog of BAF155, is a novel p53 target and acts as a tumor suppressor by modulatingp21WAF1/CIP1expression. Impaired hydroxylation of 5-methylcytosine in myeloid cancers with mutant TET2. 본 정보는 해당 기관에서 제공한 자료를 바탕으로 구성된 내용으로, BRIC에서 자체 생산한 정보가 아님을 밝혀드립니다. 소개된 내용에서 중요하게 판단되는 부분은 해당 기관에 추가적으로 사실 확인 작업을 하시길 부탁드립니다. 내용의 업데이트 또는 변경을 원하시면 관리자(member@ibric.org)에게 연락 바랍니다.